Used for hundreds of years for both their durability and aesthetic qualities, concrete pavers still offer the modern day architect and homeowner a variety of functional and stylistic benefits. To the homeowner they offer incredible curb appeal, low cost and easy maintenance. To the architect and designer, they offer versatility, variety and easy installation. Keep reading to learn some of the many benefits of incorporating concrete pavers into your outdoor architecture. Add elegance to your hardscapes with concrete pavers! Let’s start with what they are. Concrete pavers are a dry stone or brick used for outdoor flooring. Placed atop a foundation and sand layer, pavers are pounded into position. The weight of the paver itself is typically all the adhesive that is required. In the modern era, an interlocking paver is often used to ensure added stability and long term position. The fact that the intricate mosaic of stone pavers laid down by the Romans nearly 2000 years ago are still in use today is a testament to the durability of the original design. The Romans were pragmatic architects and stuck with what worked. Made in a mold that packs the sand and concrete together, concrete pavers are stronger than concrete alone. Due to their partitioned construction, concrete pavers contract and expand with the temperature without cracking like conventional concrete driveways and paths. The variety of designs into which pavers can be cast allows the designer to fit the design specifications of the surrounding landscape. Shapes, styles and colors can be mixed and matched to produce a tapestry of stone for a deck, driveway or walkway. This is in marked contrast to the bland solid white of the a slab of hurriedly laid concrete. The difference is noticeable. Concrete pavers are less likely to break and are resistant to the constant fatigue caused by temperature induced expansion and contraction. Unlike concrete slabs, which require extensive repair and replacement, damaged pavers can be replaced quickly and easily – often DIY – at an exceptionally reduced cost to that of poured concrete. If the pavers ever become stained beyond the power of a good pressure washer, don’t worry, they can be replaced without having to rip up your whole driveway. With over 20 years of experience installing pavers and stone veneers, Eric’s Concrete Pavers promises their natural stone and paver installations will exceed your expectations. We pride ourselves on our “No Call Back Policy”. 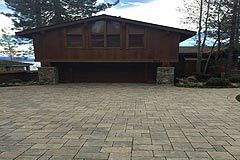 As a full service contractor in the Reno-Tahoe area, Eric’s Concrete Pavers installs concrete pavers for patios, pool decks, driveways, entryways, and more. My wife and I are thinking about building a patio in the backyard using stone pavers, so this article was really helpful. I like that you mention how concrete pavers contract and expand with the temperature without cracking like normal concrete. This sounds ideal for the crazy weather and temperature changes we get around here. Thanks for sharing! I was reading about concrete slabs and the good that it can do for a building. It was interesting to learn more about these different versions of concrete like pavers. Versatility is a great feature for a paver to have.